Cath Colour Carver, Colour your City, Open Plan studio, Derekorder Live Sessions, Kristine Cofsky, Chloe Morgan, Nadia Albino, Delicious Monster, Lex LaFoy, Brianna Klasson, Roshini Kumar, Char Loro, Lindy Sisson Jason Bempong, Marisa Gold, Kevin Fraser, Alyssa Amarshi, Sharon lee, Sophia Gamboa, Erin Lara Walton, Maggie Macpherson, Marshall Heritage, Lucy Rose Corin, Tre Akula, Aysha Keyani, Innes Cherfi, JC hermier, Tygalily Nefertiti, Yilsen, Silviana Ursu, Diandra Ursu, Elo Zar, Agord Lean, Orla Adams, Okalani Leblanc, Rob Geary, Von Redmond, Jojo Abot, Isaac Shah, Leah McFly, Russell Telen, Ralph Escamillan, Anastasia Akintemi, Dressed Under the Influence, Snap Boys, Immigrant Lessons, Let's Play Outside Creatives, Shop Wrong, Sleepless Mindz, Afroditie Creative, Leah McFly Waackeisha, Chocolate Jungle, Lafa Taylor, Will Power Cinema, Creatington, JB the First Lady, Dosh Tasti, Jungle Tribe, Vaspaan Shroff, Helen Marley, Lennox Campbell, Valerie Lina, Yanira Galvan, Barbara Chirinos, Travis Clifford, Dhia Muhmud, Alex King, Natasha Morely, Josh Ongocol, Lorin SoKool, Kim Gonzalez, TJ Jali, Cebo Nxumalo, Han Pham, Nipho Hurd, Sean Ross, F-O-R-M festival, Art Starts,& more. We are living in a pattern nation, repetition is in music, fashion, visual art, even the way we move through our cities and live our daily routines. Every pre-colonial civilization embraced pattern in their own unique way. Pattern has been slowly drained out of people through fast fashion and homogeneous global fashion trends. So lets embrace and play with bold colour and pattern through the way we dress and the spaces we live in. 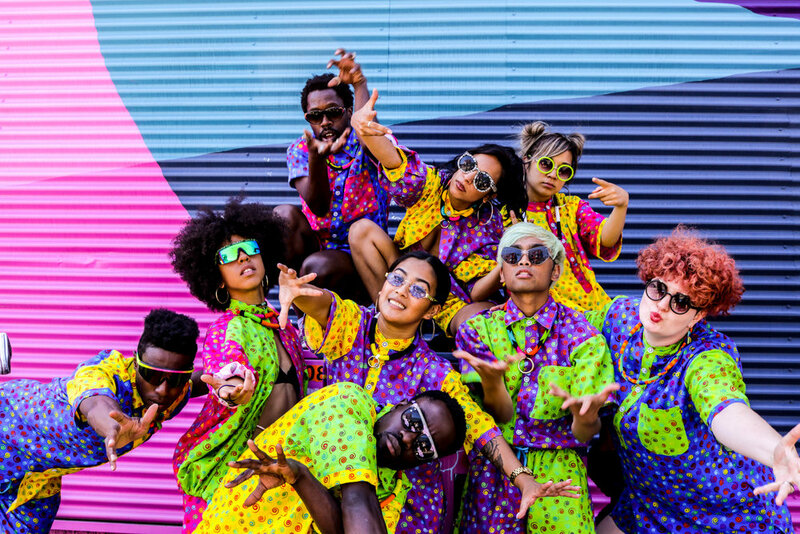 Every Artist that collaborates with or represents PatternNation embodies these values through wearing and creating art that is rich with bright colours and striking patterns. PatternNation is not only a jewelry and design brand but also a way of thinking about the world. We are constantly bombarded by minimalist esthetic - PatternNation asks you to think differently and make it funky.